During his grad school days, a Pomona English professor carried on an unlikely correspondence with the avant-garde composer via Note-O-Grams. When I think back on it—or look back, since I’ve of course saved both sides of the correspondence—the sheer temerity of the thing surprises and embarrasses me. I was a Ph.D. student at UCLA, two months from finishing my degree; he was, at age 77, nothing less than the great granddaddy of the American avant-garde. And yet I wrote him; and stranger still, he answered. I wrote Cage asking him to contribute to a collection of scholarly essays I was editing which sought to revisit the impact and reputation of the literary avant-garde of the early 20th century. He wrote back immediately. My letter was sent April 23, 1990; his reply was written four days later. Mine was word processed and printed out on the then-exotic laser printer, rather like pages of that dissertation; his, almost calligraphic, was inscribed in a scratchy hand, on a peculiar piece of (im)personal stationery called the Note-O-Gram®—a triplicate form using carbon paper, bearing his name and address in Gothic Copperplate across the top. John (as he signed himself after the first letter) followed the directions printed at the bottom of the form precisely—keeping the yellow copy, tearing out the carbons, and sending the white (original) and pink (second carbon) to me. I was meant to reply on the white & return it to John, keeping the pink; but since he’d flowed out of the “Message” column and over into my “Reply” column … I just mailed back another laser-printed letter. Shockingly (! ), John found himself with too many commitments to be able to contribute to my project: “I am busy with music and graphic work, prints, drawings, watercolors.” But he never made me feel foolish for having asked. What’s more, he asked for my help with his work—“a large work (music) connecting Zurich & Joyce” for the 1991 James Joyce/John Cage festival in Zurich. His were short letters—short, and sometimes strikingly beautiful. Reading the opening sentences of that first letter still makes my heart stop: “I would very much enjoy talking with you. 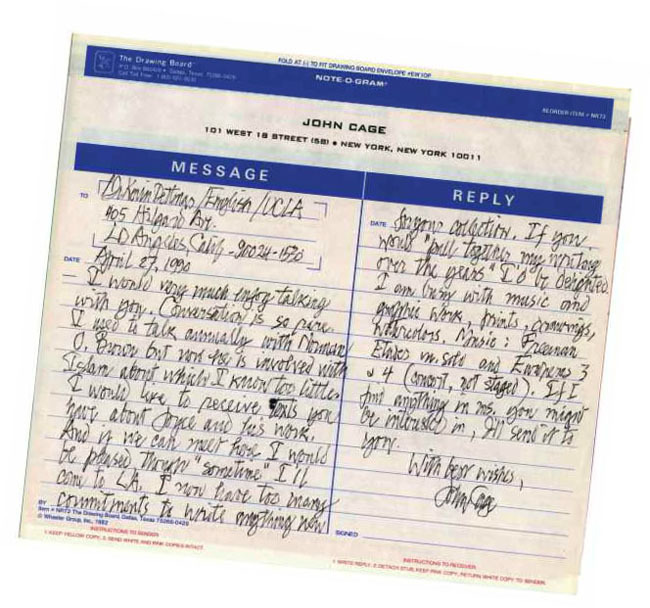 Conversa- tion is so rare.” Imagine writing to John Lennon and getting that in reply: Cage was my Lennon (who shared his fascination with Joyce—Lennon was an inaugural subscriber to the James Joyce Quarterly). In that first letter, John invited me to visit him in New York; too shy, I quietly demurred, while cherishing the hope that someday I’d screw up the courage. Two years later he was gone. The leitmotif in the three letters I received from Cage was, quite simply, generosity. Thank you for your letter and articles which I enjoyed,” he wrote on May 16. (Looking back 22 years later, I’m more than a little horrified to be reminded I’d sent him my graduate school publications.) Anyone with even a passing acquaintance with Cage testifies to this quality: no American artist of the 20th century was more gracious toward those upon whom his work had made such a profound impression. “Our intention,” Cage wrote in Silence, “is to affirm this life, not to bring order out of a chaos or to suggest improvements in creation, but simply to wake up to the very life we’re living, which is so excellent once one gets one’s mind and one’s desires out of its way and lets it act of its own accord.” Most of the photographs of Cage—and a greater percentage, the longer he was with us— capture him somewhere between an impish grin and a tremendous laugh. That’s not the picture you’d necessarily imagine when encountering his often-difficult art: but that’s the man I was privileged to get to know, just a little, through a flurry of Note-O-Grams® in the summer of 1990. Kevin J.H. Dettmar is the W.M. Keck Professor of English at Pomona College. 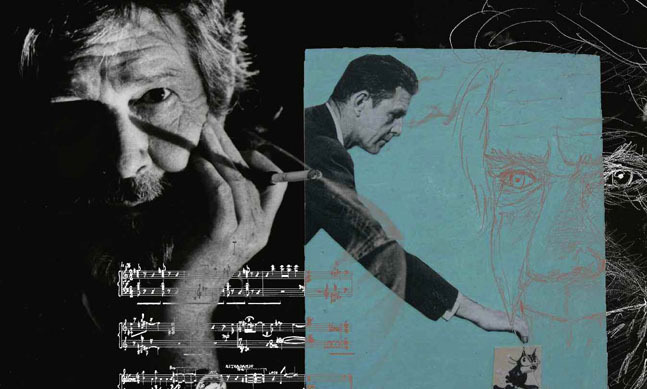 Born in 1912, composer John Cage ’32 pushed the boundaries of music, experimenting with sound, environment and audience perception. The son of an inventor, his work also influ- enced painting, dance, performance art and poetry. In 1930, after two years at Pomona, Cage left for Europe. Throughout the year the College will join the centenary celebration of his birth.